Apshalt base will restore the oil/tar content that oxidizes from the asphalt material. And make it pliable and less prone to cracks caused by climate change. It will also allow the asphalt to be reheated like the plants do and allow the material to be manipulated to remove low areas and eliminate cracks, tire or plow damage. When applied, will be a thin membrane over surface to prevent oxidation. 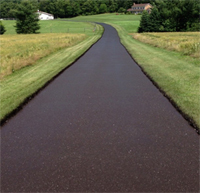 Because it will cover asphalt rather than penetrate it, latex base sealers’ color will appear to stay dark longer. And is preferred when a commercial lot is sealed for the longer term contrast with parking stripes etc. Asphalt emulsion represents a combination of the two sealers above, and may be perfect for your moderately damaged driveway. Crack filling is a cost effective way of extending the life of your pavement. We offer a full line of products to suit your needs. Whether it be high-speed high traffic DOT certified material. Commercial application or for your own driveway. We definitely have the right product for your needs and will apply it to spec to make sure you get the most for your money. Hot rubberized – the most durable for high speed traffic and most commercial applications. Rubberized – best for residential applications due to elasticity and performance in hot and cold temperatures. Acrylic – Used for sport courts and cracks in concrete . Can be ordered in color to match existing surface.